Chhaperia became one of the best Small heater elements suppliers in India. The electrical heating elements are manufactured with polyester film, quartz IR tube, Micanite, and ferrous or non-ferrous tubes. The standard, as well as customized heating elements, are available at Chhaperia. According to the application, the heating element is chosen. From small to medium to large, all types of heating elements are supplied by us. Let us know the purpose, and we take care of everything. With an ambition to produce quality-enriched products, Chhaperia became one of the best heating elements suppliers in India. Baseboard: The cost-effective heater heats the room through the displacement of air or natural convection. Convector: This format has a chimney effect due to which the heat is generated with greater projection, amplitude, and speed. Fan Heater: With a ventilation mechanism, the fan heater comes with or without variable speed. Radiant heater: Extremely safe and heats the room efficiently with its flow. All the types of electrical heaters are on the pace at Chhaperia. 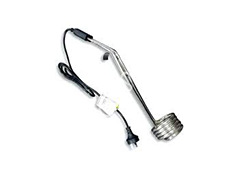 As one of the leading Small heater elements suppliers in India, we embrace the electrically heating elements with manufacturing and installation services.